Big and Uncle Roy in their younger days; Elks Club in the background? 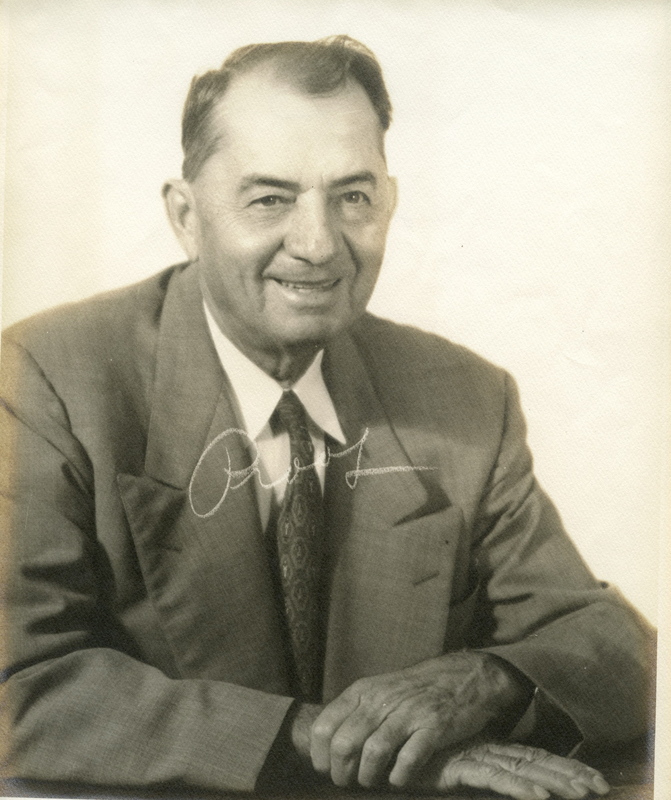 “Big (Olive West Stott) was five years older than Mama. She had been the first member of the family to leave Holmes County when she came to Greenwood to go into nurses’ training. The hospital then was in a big old sprawling house on River Road, and she was the second person to graduate from Nursing School in 1911. There were four in her class. 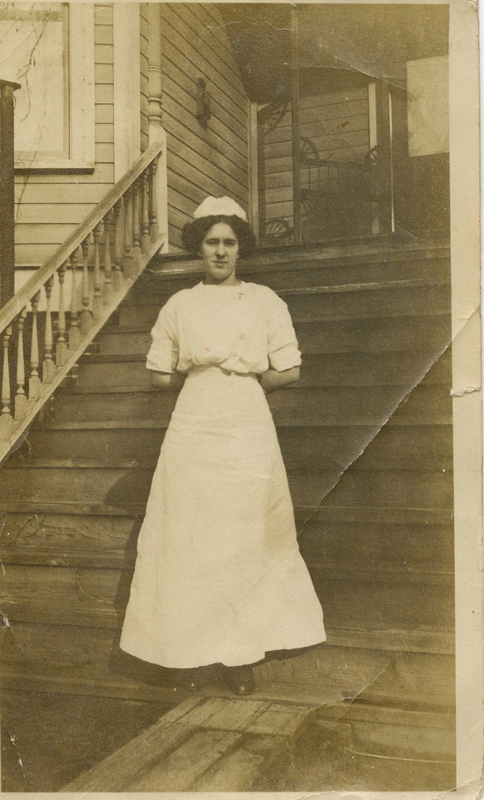 She could tell lots of stories about her early days of nursing and how they would go into the homes to nurse and be on duty 24 hours a day during the typhoid fever epidemics. At the hospital they worked in twelve hour shifts, receiving $10 a month. They furnished their own uniforms and often were sent into private homes to nurse, receiving $3 a day. 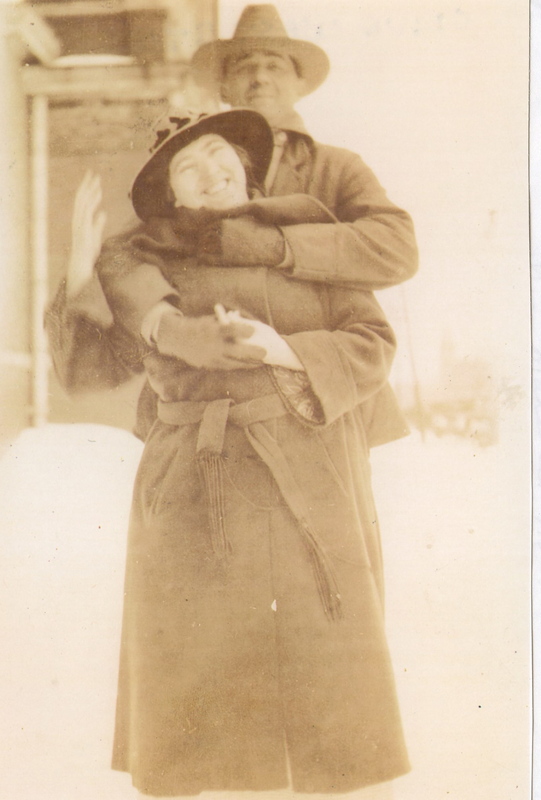 “She married Roy Stott, a country boy from Tennessee, who had come to Greenwood to work as a lineman for the telephone company in 1904. They had three children: Rena West (Rawa), Roy, Jr. (Buddy) and John Anderson. 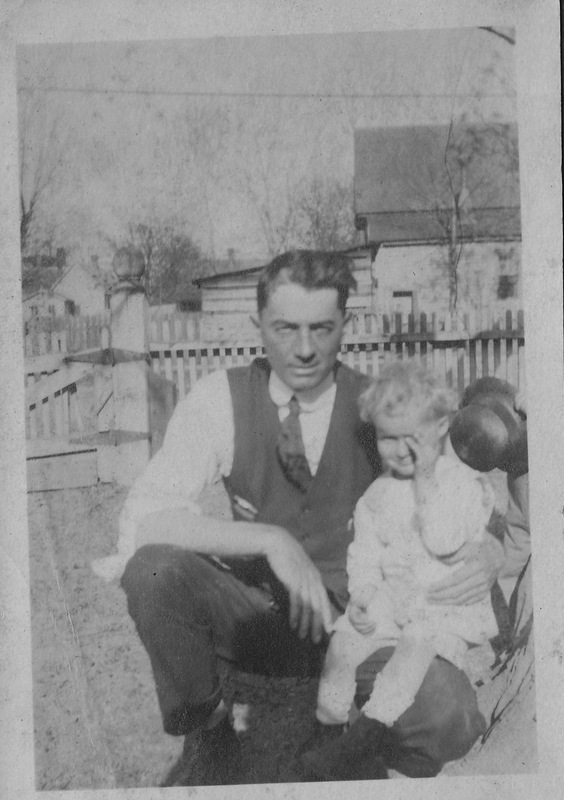 Big and Uncle Roy in front yard of 115 East Washington, 1944. The picture just above is a treasure, as it shows the Stott house in its full glory, surrounded by trees and Big’s flowers and shrubbery, even with a yard swing. As we move on through Sara’s memoirs, those of you who know this lovely brick home only as a law office, stranded alone in a sea of concrete and asphalt caddy-corner to the hideous 1960s Federal Building, will find it filled with life and laughter and some of the most interesting people to ever live in Greenwood. I knew it first as my grandmother’s home, although of course she was just a “temporary” guest. She had been there for 22 years when I came along. My favorite memories are of sitting in Uncle Roy’s chair, with the doilies on the arms, and the front porch glider hidden behind a wall of vines. Big and Uncle Roy have been gone for so long now, as have all their children, but it makes me happy every time I cross the “new” bridge (which should have been named the Roy Stott Bridge, but that’s a tale for another day) and see the dark bricks of the old house down Walthall. And if it ever goes up for sale, we’re going to have to call an emergency cousins’ conclave to be sure it’s in good hands. Too many memories to take a chance. Ed. 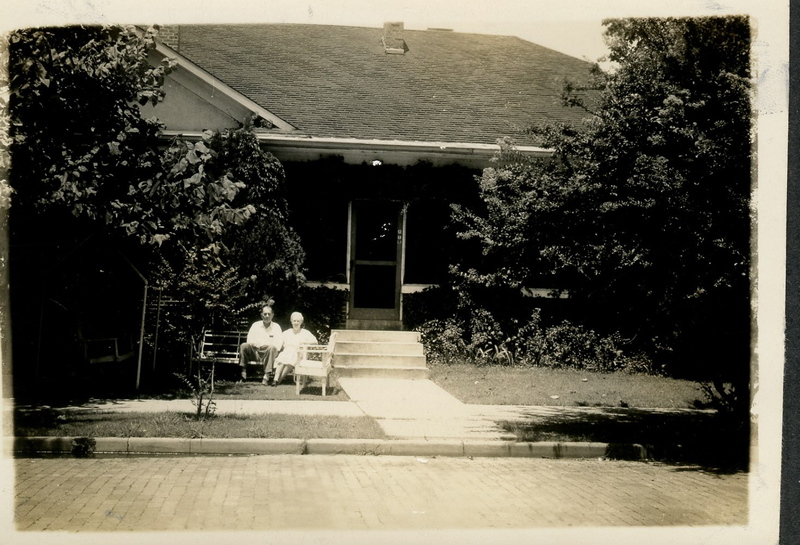 note: Greenwood’ first “hospital” was a house on West Washington street that was designated a “cottage hospital” with a few beds and limited medical staff in the very early 1900s. 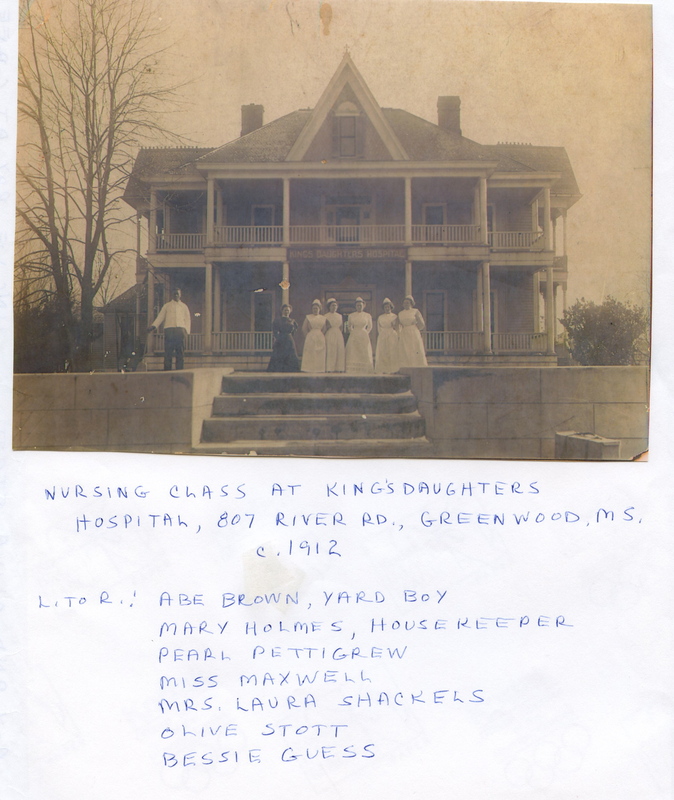 The Kings’s Daughters Circle, a women’s group, petitioned the city for $7000 to buy the house pictured above in 1908, and it was converted into the first true Greenwood hospital. By 1917, the community was ready for a state-of-the-art dedicated medical facility, and the three-story brick building just down River Road was completed in April of that year. As mentioned earlier in this blog, Jessie Evans was the first mother to give birth there when Tiny was born, and Sara was one of the last when Cathy was born in 1951. The old house hospital was torn down in the 1960s (?) and apartments now occupy the site. All that remains of the 1917 hospital are the basement of the north wing and the intact south wing, both of which are in very poor condition.